We took a walk along the Brimfield section of the Grand Trunk Trail a couple of weekends ago. Although, not completely cleared to the west of the parking lot on Five Bridge Road, the eastern portion is clear till it bumps into the Quinebaug River. At one time a bridge spanned the river at this point, in fact two bridges, one for the railroad, and another for the street railway from Springfield to Fiskdale. The walk was very nice. Quiet, with the exception of the crickets as we passed through the wetland area. No sounds of traffic, or another person. The only people we did see was a couple of kayakers leaving the rest stop on the Quinebaug River Canoe Trail. This hike was in mid August, and the maples were already turning red along the banks of the wetlands, and the mosquitoes were still plentiful. I usually keep a can of repellent in the truck, but this time I was lax, and we both paid the price. A remarkable job of restoring this portion of the old rail bed as a trail for non-motorized recreation was done. 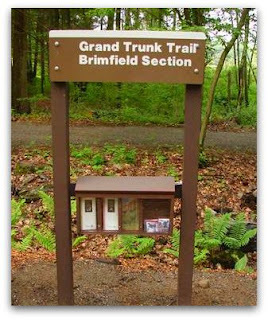 "...although the grand trunk trail blazers are a part of expanding the super trail, the work you enjoyed on the Brimfield section was the result of a newly formed partnership between the U. S Army Corps of Engineers,, (owners of the land) and the Brimfield Trail committee. It is the hard work of that committee, Brimfield DPW, and volunteers who are working to build this trail. " --Tom Chamberland. I had initially given credit to the Grand Trunk Trailblazers, but Tom corrected me.--ed note. As a part of the Super Trail that will run from Franklin to Palmer, it will offer a recreation venue not seen in these parts before. From bicycling (fat tire), hiking walking, bird watching, canoeing, kayaking, or just sitting on the banks of the river and staring off into space this trail system offers so much. For more information, go to the link highlighted above for directions and a map of the trails. With fall coming, an autumn walk in the woods may be just what the doctor ordered for a little peace, and this is a wonderful place to start. A correction, althought the grand trunk trail blazers are a part of expanding the super trail, the work you enjoyed on the Brimfield section was the result of a newly formed partnership between the U. S Army Corps of Engineers,, (owners of the land) and the Brimfield Trail committee. It is the hard work of that committee, Brimfield DPW, and volunteers who are working to build this trail.